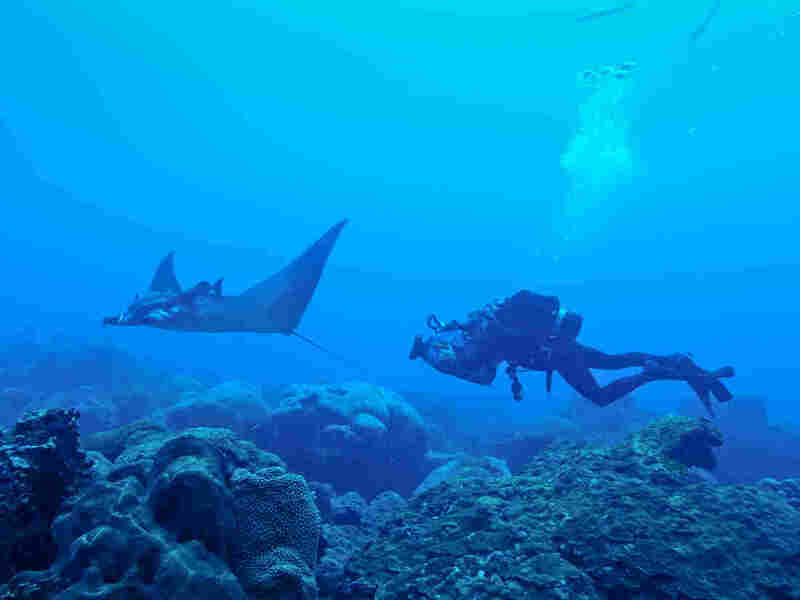 Nursery For Giant Manta Rays Discovered In Gulf Of Mexico Sightings of baby mantas are rare, but the Flower Garden Banks Marine Sanctuary appears to be a safe playground for newborns to adolescents. That's what happened at the Flower Garden Banks National Marine Sanctuary in the Gulf of Mexico, when Josh Stewart took his first dive into the protected waters and identified what has now become the first recognized nursery ground for giant oceanic manta rays. In other words, the underwater region — about 70 miles south of Galveston, Texas — is a sort of safe playground for the growing gentle-giants, from newborns to adolescents, according to a study published Monday in Marine Biology. "I was there trying to get a genetic sample from a full grown manta, and that's when I saw it. It was a juvenile male manta, which is a very rare," Stewart, a graduate student at the University of California San Diego's Scripps Institution of Oceanography told NPR. It was only the second or third juvenile manta ray he'd seen in his 7-year-career. Stewart, a co-author of the study, also serves as executive director of the Manta Trust, a global manta conservation program, and he was thrilled. When he came up out of the water he couldn't contain his enthusiasm. "That was super cool," he remembered telling other researchers who've worked at the sanctuary for years. But their reaction wasn't what he'd expected. "We see them all the time," they said. Juvenile manta ray with diver at Flower Garden Banks National Marine Sanctuary. "And that's when I knew that this was a really special, unique place," Steward recalled. Apparently, National Oceanic Atmospheric Administration researchers who manage the sanctuary believed the manta rays they regularly had monitored were a different species, and not the young offspring of the larger, endangered animals, Stewart said. Adult manta rays can range from 10 feet to 23 feet across — about as wide as a male giraffe is tall. According to the Scripps Institution of Oceanography, they're also "typically found in subtropical and tropical waters around the world with aggregation sites commonly found far from coastal areas." That makes them difficult to study but not impossible to find. Conversely, baby mantas are "vitually absent" from adult populations, so very little is known about their early and juvenile life stages. 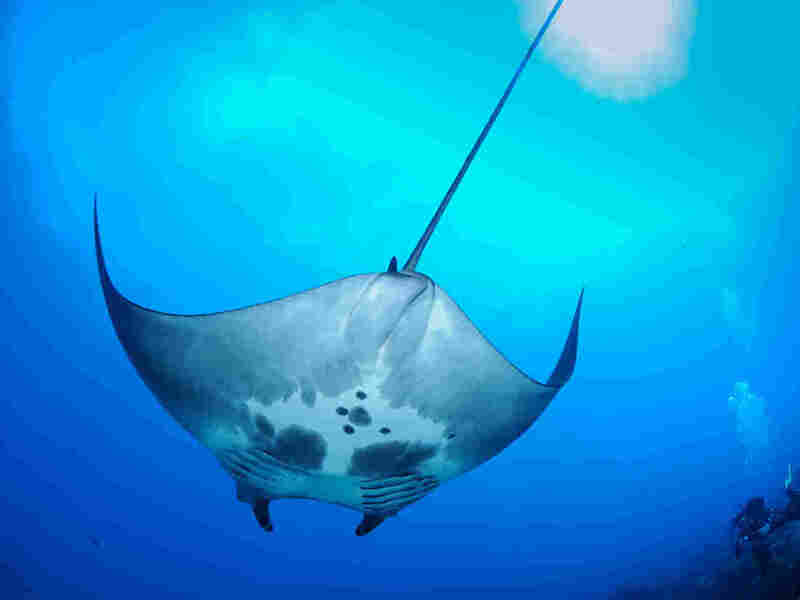 Young males can be easily distinguished from fully grown mantas by the size of their claspers, or reproductive organs, Stewart explained. Adults have elongated claspers that become calcified, while adolescents have "tiny little claspers." 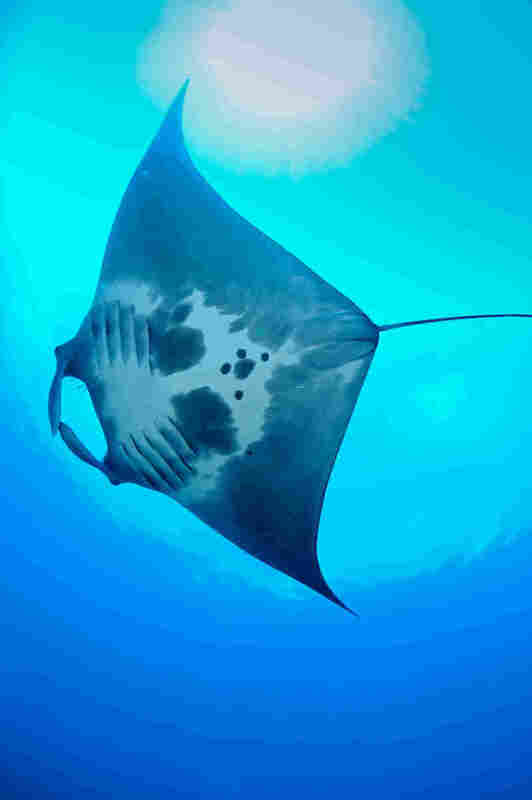 Female mantas, whose wingspans typically grow to be several feet larger than their male counterparts, are identified by their wingspan size. Stewart's discovery is expected to provide a trove of new and valuable information, and a major advancement in the scientific understanding of the species. "The juvenile life stage for oceanic mantas has been a bit of a black box for us, since we're so rarely able to observe them," said Stewart. "We don't know much about their movements, their feeding behavior and how that compares to the adults. Now we have a pool of juveniles that we can study." Getting the sanctuary classified as a juvenile habitat will also provide insights on identifying other sites around the world, Stewart argued. What Hidden Underwater Worlds Are Left To Discover? "This research backs up the need for protection of other critical habitat, especially since manta rays have recently been designated as threatened species," Michelle Johnston, co-author of the study told the Herald Sun. "Threatened species need a safe space to grow up and thrive and live." While their gigantic size often serves to protect the creatures from other predators, it's also a leading cause of their demise: Mantas often end up as bycatch in large fishing nets. They are also sought after for their gill plates, later sold for medicinal purposes in China, National Geographic reported. The giant manta ray was added to the the U.S. endangered species list in January.